Set in the near future where Mother Nature has decided to fight back against all of the human encroachment. It has your standard apocalyptic scenario, but we're right in the middle of the apocalypse actually happening, rather than the aftermath. Vines and foliage entangle cities, as large wooden mech-like creatures called Arethusa (named after one of the mythical Greek Hesperides that tended the gardens in a remote corner of the world) rampage through cities. Our main character is Souma Shin, a punk kid out of Japan. We start off with him coming to visit his twin (?) brother Ken. All hell breaks loose as Shin finds a group of small kids being used for military purposes, and tries to save them in the confusion created by an Arethusa invading the compound. 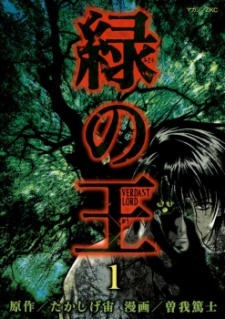 While the premise of the story of Midori no Ou, or Verdant Lord, showed alot of promise of complexity and interesting relations of the characters and the world they live in, it's excecuted in a pretty subpar manner, progressively moving the ideas that made the concept interesting into the gutter, adding more and more action and in general fighting, while also raising the proportions of the conflict in the same way. By itself it's nothing bad, but it leaves an unsatisfied feeling since you can't get much invested in the characters involved, who misses motives beyond their most basic "purposes", set in the manga, and personality in general. Art-wise, the characters looks well, despite lacking much of distinctive personalities, the mech design is plain and practical, and the Athreusa, with all it's shapes and forms, looks very creatively thought out and interesting. Also the action scenes are excecuted well and fluidly. In short, the manga is pretty nice if you are looking to read something action-packed, with not that complicated story and not too long as lenght, having on, conceptual level interesting story, although rushed too much at the end.